Ayurveda considers the body to be the end product of our digestion. What we eat makes up our body and influences our thoughts, emotions, and outlook on life. When talking about Ayurvedic diet we need to keep in mind two models: ideal and real. Always remembering the perfect standard, we can start only at the point we are right now. Ideal diet: The purpose of the material incarnation is spiritual progress. Vedas precisely indicate the steps we need to take, that include giving up consuming meat, fish, and eggs as products of violence; and quitting the intoxicants (alcohol, black and green tea, coffee, and caffeinated drinks). Real diet: Ayurveda advises everyone what to eat to stay as healthy as possible on any stage of our self-awareness. Ayurvedic diet differs for different people and depends on our constitution, age, health condition, and the season. All of us deserve good health, no matter how spiritually aware we are. A healthy person is more likely to be interested in spiritual progress than a sick one, by the way. Well-planned vegetarian and vegan diets are nutritionally adequate and appropriate for all stages of life including pregnancy, lactation, infancy, childhood, and adolescence and can provide adequate intake of protein, minerals including iron and calcium, and vitamins. Planning is crucial. A poorly planned diet can be low in essential nutrients regardless of the presence of meat. Balancing the diet takes an effort, but the results are worth it. Pure body and mind, clear perception, and peace are the distinguishing features of true vegetarians and vegans. How to plan a sufficient diet? Start with using a cook book until you get experienced enough to play by ear. Most Ayurvedic cook books are vegetarian ones. Almost all of them include dairy in the daily diet, considering milk beneficial for both body and mind. I have mentioned some good Ayurvedic authors in my earlier posts. What about vegans? Is it possible to eat Ayurvedic and vegan at the same time? The answer is yes. 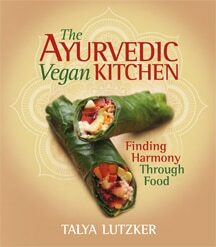 I came across Talya Lutzker’s book The Ayurvedic Vegan Kitchen and was amazed at how well Ayurveda works for the vegans too. The author combines the skills of a certified Ayurvedic practitioner and a professional organic focused chef, which resulted in an understandable and easy to follow book. Not only does it have over 120 delicious recipes, very well organized and with helpful hints, but also gives the basic Ayurvedic concepts so clearly, that everyone can easily grasp it. If you didn’t know your mind-body type yet (Vata, Pitta, or Kapha), you can determine it at the very beginning of the book and then choose a recipe which will balance your body and mind. Talya is extremely resourceful and plays with ingredients like an experienced conductor to perform the best. She also makes every dish adjustable to your constitution suggesting which ingredient to add or omit for your dosha. Although I am familiar with a good bunch of Ayurvedic cook books, Talya was able to surprise me by using ingredients I have never used or even heard about, such as Jerusalem artichoke syrup, sea palm, ume plum vinegar etc. Actually, Ayurvedic Vegan Kitchen is not for vegans only, everyone can find here a new inspiration that enriches their menu and makes healthy eating fun. One who consumes milk, for example, can substitute almond or coconut milk for cow milk. It is fun though to try some alternatives too. If you are not ready to give up meat, it is OK to start with using sides from this book. I’ve already tried two recipes (Quinoa poppy seed pancakes and Tahini cucumber dressing) and must say, they taste delicious! Why do some people eat poorly and stay well and vice versa? Have you ever ask yourself why some individuals eat and drink whatever and whenever they want and are healthy and some are very careful about it and still have health issues? It happens because of karma earned due the good deeds in the past. The sum of good karma is a reserve, that gives us fourfold benefits: health, money, good relationships, and ability to learn. When we eat wrong, we waste the funds accumulated in the past for staying healthy, instead of getting other benefits. As soon as we have spent all reserves, illness may occur. Our deeds in the current life will form our next life karma. Why should I renounce animal products? The improvement of physical health is not that obvious and can’t be a long term motivation. Only apprehension that a cow or a prawn has a soul just like us makes it effortless and irreversible. I have experienced that change myself and saw it so many times in other people.